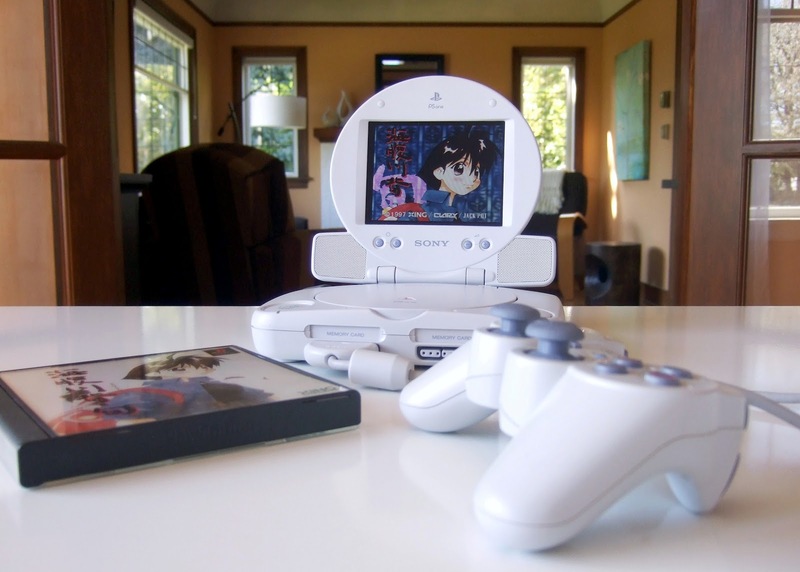 The Gay Gamer: Who needs a stinkin' Vita when you've got a PSone with a monitor? Who needs a stinkin' Vita when you've got a PSone with a monitor? OK, so that's kind of a silly question. And, really, I'm not trying to suggest with the header above that I don't want a Vita. On the contrary, I'd very much like to own one someday, despite the fact that I currently find the system overpriced and lacking a bit when it comes to an appealing software catalog (aside from the games I discussed in this recent post). That said, I can't imagine I'll ever have more fun with my imaginary future Vita than I will with the system seen in the photo below--which is a Japanese PSone with a nifty little Sony monitor strapped onto its back, in case you've never laid eyes on such a thing. I recently picked up this killer combo via eBay for just $60, by the way. I've been looking to buy a Japanese PSone for ages now, so when this auction popped up I did whatever I could to ensure I won the damn thing. Anyway, thanks to this awesome acquisition, I'm now experiencing another full-on PlayStation obsession--which of course means I recently snapped up a few Japanese PS games (such as the crazy Shake Kids! that I mentioned during the latest episode of The Nichiest Podcast Ever) to play on my shiny new (not really) PSone. I'll do my best to write about as many of them as possible in the coming weeks and months, of course. At the very least, though, you can expect me to write about the most interesting ones. Do any of you own one of these wonderful contraptions, by the way? I know some will say they're kind of pointless in this day and age, when many PlayStation titles can be played on PSPs and Vitas, but I've always been a sucker for playing games as originally intended. Plus, the PSone is so adorable it's kind of hard to resist--which may explain why I now have two (the one shown above and here is of the North American variety). Anyway, now I have a great/easy way to play all of my new Japanese PSone imports. Yay! Oh, and double yay: that means I'll finally be reviewing some of those suckers in the next weeks and months! Fantastic news on all counts! Do both parts run off batteries? Neither! The PSone system/console itself has to be plugged into the wall just like always. I think you may be able to find a car adapter for it, but I'm not sure. Actually this is a good idea since modern TV's make PS1 games look like crap. I can't wait to hear more about Shake Kids after you talked about it on the podcast. Also, will there be Jingle Cats? As for Shake Kids: you can count on me to write about it, and share photos of it, etc. And eventually review it, of course. I can't comment on the PSX, but I do want to say that your house is cute as hell. Seriously. If the rest of it is as great as the background of this shot, dang! Oh! I didn't even think about our living room appearing in the background of this photo, Justin. I just wanted to give folks a different perspective (other than our dining room table or dining-room floor, I mean). Anyway, thanks! I love our house. In fact, if we planned to stay in Seattle for the rest of our loves (we don't), I'd never want to move from this house. That's how much I love it. I love how small flat screens make PSOne games look so nice, it's especially neat on the PS Vita's OLED screen. :) The digital PSOne games do look rather great on the big screen thanks to the PS3's awesome upscaling as well tho. Oh, wow. I'd forgotten that thing existed. I remember wanting one back in the day because I thought it was as close as I'd get to having a semi-portable version of Final Fantasy 8. Very cool. That makes me smile to hear it. And I'm not sure if it was clever wording or a typo, but "rest of our loves" made me smile. Where would you go? Ha! Nope, I didn't mean to say "loves," but it does seem oddly appropriate, doesn't it? As for where we'd go: back to Wisconsin for a while, and then ??? Ha! That's great, Zaphod. And, really, this isn't exactly the best option when it comes to actual portable gaming, but it's pretty great when all you want to do is play games while in bed, etc. 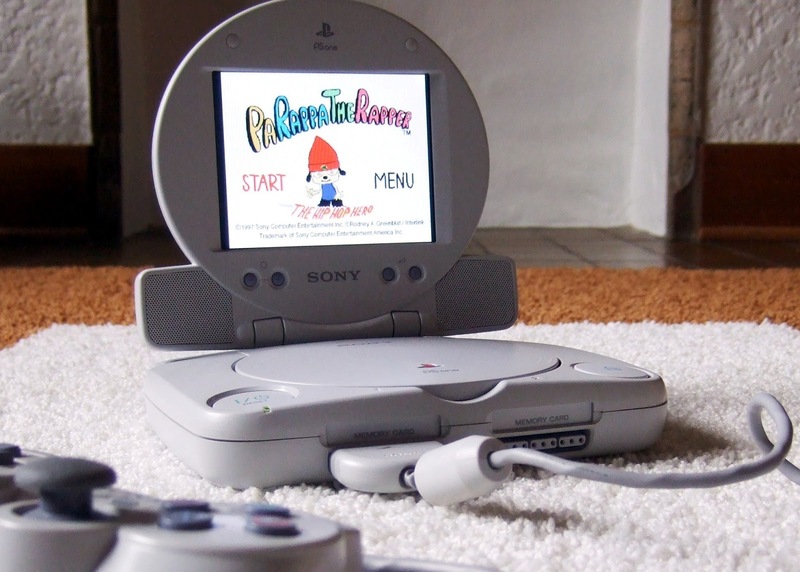 Aw the little Ps1! I remember I had one back when I was a kid. I remember I always preferred the screen, probably because televisions in those days were big bulky bastards. Great purchase! True. These days I have most of the Final Fantasy games on my Vita, but that PS1 screen was an enticing option. 3rd party battery packs for the PSOne+screen combo are available. I have one, its almost as big as the PSOne itself. It sits under the PSOne so it looks like 2 stacked systems, but has a large plastic cage that grips the console to hold it together when on the move. Prior to owning a PSP I used mine on the bus and train. Oh, it's going to happen sooner rather than later, Justin. We've been talking about this for some time now. Just need to wait for a few things to fall into place. Actually, I didn't play any PSX games this weekend thanks to Super Mario Sunshine and Witch & Hero. I'm planning to put this sucker to good use, though, as soon as my copy of Shake Kids finally arrives (along with another unnamed PS1 game). I do not own one of those, no. :) I still have an original PS1 bouncing around, hooked up to my tv upstairs. Of course, it's a funny title for this post since I spent most of yesterday playing my Vita (while working on my PC for about fourteen hours in the den). Man. You might be close enough to actually get to meet in person. That would be AWESOME.